Most of the applications I spend my time with throughout the day are the usual suspects: MarsEdit, NetNewsWire, Instapaper, et al. Below is a look at how these apps get used and why. I usually have a dozen or more tabs open at any given time. I send a lot of stuff to Instapaper, and read a lot in the browser. Usually I’ll scan RSS or Twitter, open up lots of links at once, and then comb back through and read them. I also spend a significant amount of time reading on my iPad, but more on that below. Instapaper has become as much of a business tool as it is a reading and entertainment app. I send at least a dozen articles to Instapaper every day because there is always something new flying across my browser, feed reader, or Twitter stream. I do read quite a bit out of Instapaper but not as much as I put in. And I’m okay with that because, in part, Instapaper works as a placebo for me. Saving it to read later relieves me of any stress about having to deal with the article that minute, and I’ve also found that articles which seemed important at the time are no longer important when I get around to my Instapaper queue. So in that regard Instapaper saves me peace of mind as well as time. I have turned into a bit of a poor correspondent. I do read all my incoming email. I get a lot of great feedback from you guys, and many of you send in links to things you’ve built or written. I love that stuff, it’s just that I’m not always able to respond back. I feel like as I am still finding my rhythm as a full-time writer and blogger so I’ve been more or less ignoring most other things until I get the pace of my day settled. Then, I’ll add things back in — such as better email correspondence. Something I did not expect is to find such a huge amount of value from Twitter. Before I was began writing the site full-time, Twitter was a distraction when I should have been getting work done. Or it was a spot to spend some free time. Now, it is a tool. I’m an extrovert and a verbal processor, and I love using Twitter to bounce ideas and questions around. It’s a great way to get feedback and input that I don’t otherwise get since I’m working alone in an office. On my Mac and iPad I use the official Twitter clients. On my iPhone I use Tweetbot. I do a lot of writing, random jotting, and note taking in Notational Velocity. I use Simplenote on my iPad and iPhone quite a bit, and so all three are synced. Some people are super fancy with how they use Notational Velocity. I don’t really tag items or any fancy meta stuff like that. I like that the latest work is always at the top and it’s quite easy to search for things that may be buried. A great many blog posts start in Simplenote or Notational Velocity when I have an idea for something but it’s not fully formed yet. It goes into this app because then that idea is available to me wherever I am. If inspiration strikes while I’m at the hardware store or in the yard it matters not. Yojimbo is the one application on my laptop that is always running. And, aside from the utility apps that live in the Menu Bar, Yojimbo is the only app that launches on startup. There is no set rule for how I use Yojimbo — it is just the app which I use to toss anything and everything into that may not have a more logical place to be stored. I use it for passwords, bookmarks, quotes, tips, recipes, directions, and more. And I have Yojimbo’s search field set to activate globally whenever I hit Command+K — I search for items in Yojimbo nearly as often as I put them in there. One question I often get is how I use Yojimbo differently than Notational Velocity / Simplenote. Rest assured that there is a marked difference between what goes in Yojimbo and what goes in Notational Velocity/Simplenote. Primarily it’s that the former is for anything I want to keep long-term; the latter is for anything that is short-term or in-process. My application launcher of choice is still LaunchBar. I use it primarily for switching to and activating apps of course, but also for running a few scripts, and looking up words in the Dictionary. And the clipboard history… my, how I love the clipboard history. 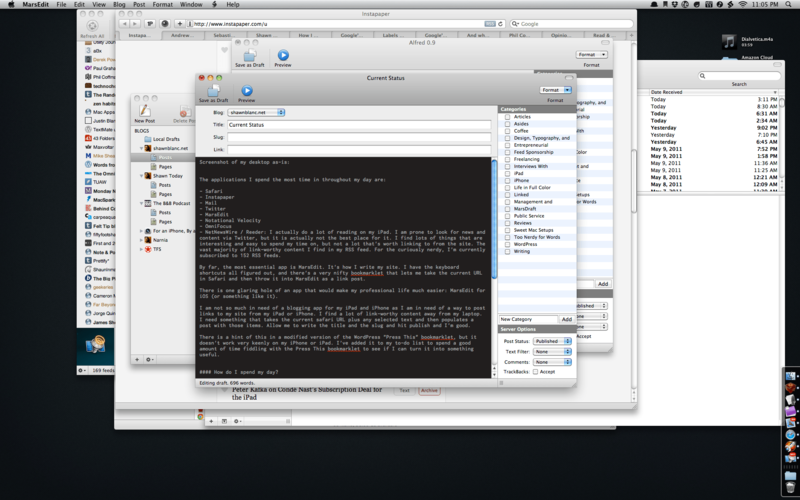 I use TextExpander primarily when writing and replying to email. Mostly it helps me with signatures and common replies to common types of emails I get. The big aha moment for me was when I realized that though I could use it to help automate my responses to certain common emails I get, that automation didn’t mean my replies were any less personal. In the six months or so that I’ve been using TextExpander, I have expanded 568 snippets and saved 55,423 characters. My link shortener and file uploader of choice is Droplr. I share a lot of screenshots and files and text with people via DMs and iChat throughout the day and Droplr is what I use for that. I have the Droplr hotkey set to Control+Option+Command+D. Also, in case you’ve ever noticed and were curious, I use Droplr to create RSS-standards-compliant URLs if I am ever linking to a web page that has a question mark within the web address. Now that I have a bit more open schedule I don’t need a full-fledged calendar application running all the time or taking up icon space in my Dock. I’ve been using Fantastical for a while now and love how easy it is to use, and how it can pretty much replace my day-to-day usage of iCal. I am a newcomer to Keyboard Maestro, but it only took a few short hours before I was converted to a junkie. It is, by far, one of the most powerful, interesting, and helpful apps I have ever used. It is hard to explain in brevity, but as best I can describe it it’s an app for power users whom understand the power of AppleScripts, Automations, and hotkeys — yet who don’t know how — or don’t enjoy — to write AppleScripts. I use OmniFocus differently now that I am writing full time. I still add all my to-do items into OmniFocus, but it’s not always the primary to-do list that I work from during my day. There are often things which I want to do for the site that I don’t have time to do now and so I’ll set them as due in a week or two. But — as usually seems to be the case — I am just as busy a week or two later as I was when I was too busy to do that item the first time. Therefore, OmniFocus is primarily full of things that should get done but which are not vital to the survival of this site. I review the list every day (usually on the iPad) and will re-arrange what has shown up as due that day down to only what is necessary and what is reasonable. However, I usually don’t review my OmniFocus task list until later in the day — often times preparing for what is needed to do tomorrow rather than today. The reason for this is that in the morning when I am first starting out, I usually write down onto paper what I want to get done that day: is there anything I especially want to link to, are there any emails I know need my attention, etc. The Web is always moving on to the next thing. Something that is hot right now will be cold in a few hours. An article I’ve spent days or weeks working on is only exciting for a day or two, and may not bring any new traffic or readership to the site. There is a constant turning over of projects and goals — things move fast online. Because of this rhythm I’ve noticed that it is easy to look back at a day spent writing and reading but feel as if I didn’t actually accomplish anything that day. Which is why it’s important for me to have a short list of the things I wanted to do and when I feel as if my day was unproductive I can look at the list and see that I actually accomplished all that I wanted to. Put another way, writing a weblog full time is not unlike farming. Lots of chores and lots of busy work that take up time every single day, but the fruit of that labor is seasonal. My daily to-do list helps me stay on track, and OmniFocus helps me keep the long-term, seasonal goals from slipping through the cracks. I have been rocking back and forth between my usage of Twitter and RSS for finding news, stories, and information. Though I am prone to look for news and content via Twitter, I am finding that it is not the best place for link-worthy content. Sure, I find lots of things that are interesting and easy to spend my time on, but most of the time they are things which are not worth linking to from shawnblanc.net. The vast majority of link-worthy content I find in my RSS feed. On the Mac I still use NetNewsWire. However, I am most successful at combing through my RSS feed when I’m on my iPad. And on the iPad I use Reeder. Unless I’m really focused on a project I try to take at least one or two breaks in my day to sit down and comb through RSS feeds. For the curiously nerdy, I am currently subscribed to 152 RSS feeds. I do all my recordings for Shawn Today with WireTap Studio. I have the metadata for file name and audio type and quality pre-set so that once I’m done recording I just add the album artwork and upload to the S3 server. By far, the most essential app to my life as a blogger is MarsEdit. This is where I write my site. I write in Inconsolata, 13 pt, light text on a dark background. I have the custom keyboard shortcuts for markdown all set. And MarsEdit has a helpful bookmarklet which lets me take the current URL in Safari and then throw it into MarsEdit as a link post. And thanks to MarsEdit’s “live preview” ability, I can see exactly how the post will look when published on my website without having to write live to the site. A side-note for the curious: my iPad gets very little use as a writing tool. If and when I write using my iPad it is with Simplenote. However, the iPad is primarily used for reading: reading my Instapaper queue, reading RSS feeds, and reading eBooks. Also, as mentioned above, I use it to review and scrub my OmniFocus lists because OmniFocus on the iPad is killer. There is one glaring hole of an app that would make my professional life much easier: MarsEdit for iOS. Or something like it. I am not so much in need of a full-fledged blogging app for my iPad and iPhone so much as I am in need of a way to post links to my site from my iPad or iPhone. I find a lot of link-worthy content away from my laptop. Either when I’m reading on my iPad or surfing the Web on my iPhone. What I need is an app that takes the current Mobile Safari URL, title, and any highlighted text and then populates a post editing window with those items. From there, if I could adjust the title and the slug and hit publish, I’d be happy. There have been hints of this in various forms, such as modified versions of the WordPress “Press This” bookmarklet and other plugins, but there is nothing ideal just yet. I’ve added it to my to-do list to spend a good amount of time fiddling with the Press This bookmarklet to see if I can turn it into something useful, but I haven’t gotten there yet. I have yet to find a best-of-breed blogging app for the iPhone or iPad that meets my narrow and specific needs.